Maclise produced a second group portrait following the publication of The Fraserians, which featured important women writers of the day, many of them key players in the emerging periodical networks.... The portrait includes Maria Hall (who would become editor of St. James's Magazine [1861-82]), Elizabeth Letitia Landon (who published reviews in the Literary Gazette [1817-63]), Mary Russell Mitford (whose work appeared in the Lady's Magazine [1770-1847]), Lady Sydney Morgan (who wrote for the New Monthly Magazine), Harriet Martineau (a regular contributor to the Quarterly Review), Jane Porter (who contributed to the Gentleman's Magazine, among other periodicals), Caroline Norton (editor of La Belle Assemblée [1806-37]) and Countess Marguerite Blessington (later the editor of The Keepsake [1828-57] and Heath's Book of Beauty [1832-47]). They are all recognizable, especially with a little help from the "Poetic Association" site. Lady Blessington stands on the right, looking at the book held up by Caroline Norton, always a striking figure. Lady Morgan, seen from the back with her face in profile, is looking at them both. 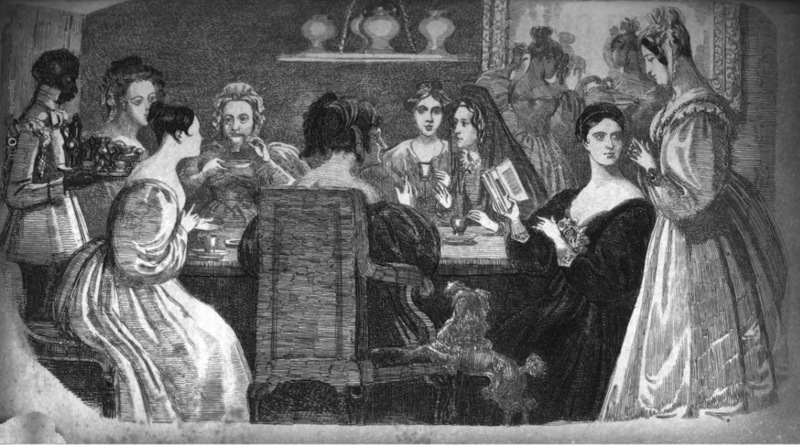 Next to them, at the back of the table, wearing a mantilla, is Jane Porter, with Harriet Martineau next to her, almost at the centre. Then, towards the left at the back, is Mary Russell Mitford, raising her cup to her mouth, while Anna Maria Hall sits just by the servant — mentioned as "one of Afric's injured line" in the text itself ("Regina's Maids," 80). Landon, with dark hair, is talking animatedly across the table to Jane Porter. To Stern, this companion piece to The Fraserians presents "a stark and overly gendered contrast" to the all-male "brazen, assertive, and sometimes even inebriated" group (Stern 65) of the previous year. Most obviously it shows a domestic setting, with the women gathered round a tea-table, taking tea or coffee instead of alcohol, and conversing pleasantly and intimately with each other rather than operating as a whole. There is a pet dog as well as a servant in attendance, the former begging for scraps from the table, or perhaps simply wanting his mistress's attention. The accompanying text is part-admiring, part-teasing, especially when it comes to Lady Morgan. "It is, in short, less a site of intellectual cohesion than a space of civil, yet sequestered and disconnected interaction," says Stern (65), suggesting that the two etchings together reflect the tension between the two types of critical community then in operation. It certainly seems that the more established one is both more heavily populated and more powerful than the other. "Poetic Associations: The Nineteenth-Century English Poetry Collection of Dr. Gerald N. Wachs." (2015 Exhibition at the University of Chicago Library). Web. 9 April 2017. "Regina's Maids of Honour." In Vol. XIII (January 1836): following p. 80. Hathi Trust. Contributed by the University of Minnesota. Web. 9 April 2017.